Buy tickets before this Friday at midnight, and guests will save $10 per person on admission to the Hollywood-themed party. Now is the time to buy tickets to one of the coolest winter parties in Rhode Island, the Providence Preservation Society’s Winter Bash. Every year, the committee comes up with a creative theme, and guests love researching costumes and getting all decked out to go along with the impressive decor. 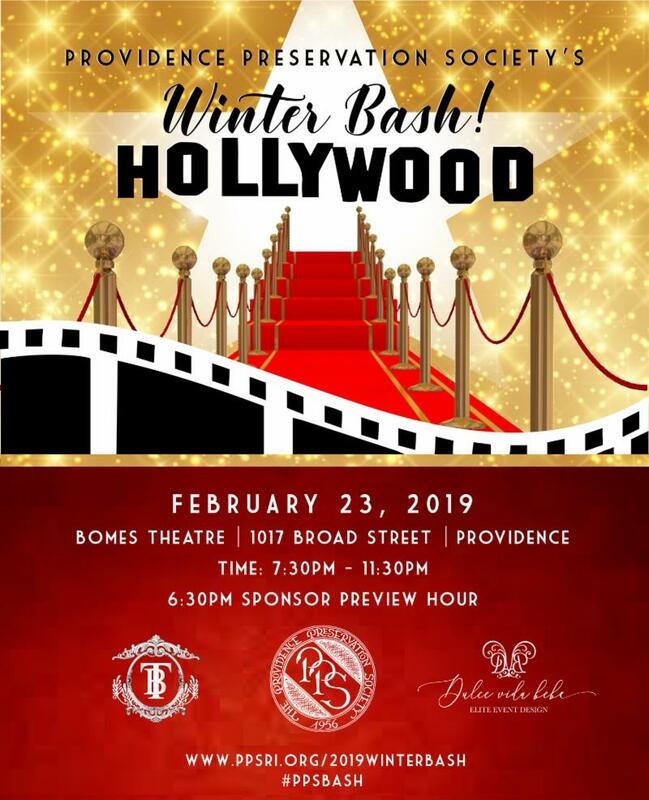 This year’s PPS Winter Bash theme is HOLLYWOOD, and the party is happening on Saturday, February 23 at the recently renovated Bomes Theater. Buy tickets before this Friday at midnight, and guests will save $10 per person on admission. I’ve been to at least three PPS Bashes, and every year, the guests go all out planning their costumes, and the historic venue where the party is hosted always has an extraordinary story behind it. The Providence Preservation Society chooses a new location each year, and it’s always a property that is being saved to go along with Providence Preservation Society’s mission. Just before Oscars season, start planning your Hollywood costume now, whether it’s Marilyn Monroe, Clark Gable, or a more recent star like Lady Gaga, Mary Poppins or the timelessly fashionable Gwyneth Paltrow. Helpful hint: Hit up one of Providence’s many vintage stores, and you just might find an old Hollywood gown or tux to be the best dressed people in the room. Ticket prices include music, entertainment and complimentary bites, but it is a cash bar. VIP ticketholders have access to the exclusive VIP lounge with bottomless bubbles and gourmet treats from Rhode Island’s most popular restaurants. A special sponsor preview hour will take place from 6:30–7:30 p.m. General admission begins at 8 p.m.
Tickets are $35 for early bird admission (purchased before Friday at midnight), and after that they are $45 each. VIP early bird admission is $90 per person (also for PPS members), and after Friday they are $100 each. Editor’s note: Jamie Coelho is a committee member of this event.